Fuel economy and ease of handling keep the little Focus at the top of the list with people who prefer compact vehicles. The newest versions feature a number of upgraded interior features. If in the market for an economy vehicle, see our lineup in Bennettsville. 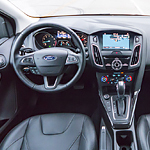 The upholstery in the Focus includes leather-trimmed seating with alloy trim and French seams. But, enhance the seating further by adding heating options to the front seats. A leather-wrapped and heated steering wheel is another option. Increase driving comfort by getting the powered adjustable seating and four-way headrests. Consumers are pleased to learn that the upholstery fabric is made using recycled materials. The foam in the seat cushions is created from soy. Used plastic products are recycled to create the air cleaner assembly, the underbody shields and the arch liners in each wheel. Take a Focus for a test drive at Bennettsville Ford and have some fun.